If you really want to make waves in your workout and take your game to the next level, the Wavemaster XXL is perfect for you. Extremely effective for improving your cardio as well as a great means for perfecting your strikes and kicks, this bag is ideal for both boxing and kickboxing training. WHAT IS A WAVEMASTER XXL? The Century Wavemaster XXL is a freestanding heavy bag, meaning there is no need to hang it from the wall or ceiling or to haggle with a stand. Simply fill the base with sand or water and you are set. The bag is portable too so you can easily take it with you to go workout with a friend or bring it along when you travel. 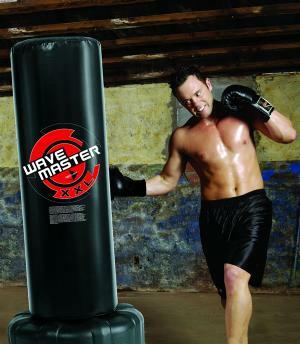 There are several versions of the Wavemaster and each one has it's value in an MMA training session. There is the Original, the Cardio Wavmaster II, the Wavemaster XXL with Scoring Zones, the new Super X Wavemaster, the Powerline and the Lil Dragon and Kid Kick Wavemaster for youngsters. The XXL has the same basic features as the Original, only magnified. The Original also sits on a large sand or water filled base but while its bag comes a few feet from ground level, the XXL has an extended base that goes almost all the way to the floor. This makes for more surface to kick and strike. Standing 69 inches tall, the XXL provides five feet of workable space. When filled, it weighs in around 270 pounds. The base is low profile so it is very stable and secure and will not wobble or scoot. Like the other Wavemasters, this version is constructed of high density foam and a durable vinyl cover. You have your color choice of black, red or blue. There are a multitude of benefits you will experience when you workout with this bag. You will increase your strength, stamina and accuracy because this bag allows you to give all you've got for as long as you can give it, unlike a human target. 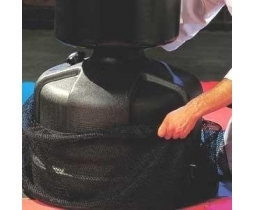 You will able to practice specific strikes and punches and combos too because this bag will not roll around or swing back and forth like a heavy bag. When you workout properly and fully with the bag, you wil get in shape quick and use muscles you don't normally use in training. The XXL version is my of the models. It is the bag I picked for my nephew, favorite who is a black belt, except his has scoring zones. At 69" tall you can practice very high kicks. The circumference is realistic as well, with an 18" surface area. This bad boy has the largest surface area on the market for training bags. It is made of vinyl and underneath is high density foam. Do not worry it won't dent! The XXL has always been a top seller and the only complaint has been the price. I am here to remedy that. We have the Wavemaster for a very low price. We help you out as well by finding the lowest shipping cost. As a martial arts instructor I do recommend the Wavemaster and No I do not recommend all brands and bags...only the best on this site. You will want to protect your bag with a base cover. This cover fits all freestanding Century products. Other great additions to your investment are these very imformative instructional DVDs. In the first video, "Wavemaster XXL Basic Bag Work by Century", instructor Dave Kovar goes over what you need to know about the basics of bag work. Along with learning principals of the bag, you will learn basic kicks, punches and safety tips. 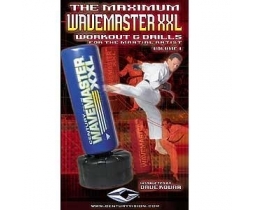 In "Wavemaster XXL Advanced Drills by Century", Dave Kovar demonstrates to even the most experienced bag practitioner new and unique ways to use the product and even new ways to use the base making this rogram a "must have" for all serious trainers and Martial Arts school owners as well. Eric Wong trains UFC fighters such as Jeff Joslin, and he wants to train you as well. He believes there is a "better" way to train and I agree. This training method is faster and more efficient than most, leaving more time for skills training. I've looked at a lot of training manuals, and I am biased about training. I like what Eric is doing and recommend his book.